Recommended Hardware and Computer Specs – How can we help? For a quick overview of all hardware and payments providers that currently work with Vend on iPad, Mac or PC check out the Vend Hardware Guide on our website. Below is a list of Vend's recommended hardware, here you can find a selection of printers, scanners, cash drawers and label printers that work with Vend. If you would like to set up this hardware yourself, you can follow along with step-by-step instructions by clicking on the relevant links below. If you are a bigger store with more complex requirements or need some in-person help, our Vend Experts are here to help. They can completely remove the hassle of getting and setting up hardware in your store. Get in touch with a Vend Expert to arrange an in-person visit now. Vend is designed to run in the browser. This means it runs on most computers.We do have some recommendations to ensure you get the most out of Vend. PrintingStar TSP100 (143) LAN or Epson TM-T88V LAN. You can also use the USB model of the Star TSP100 (143) if you prefer. For more information on how to install these devices for a Windows computer, click here.Star TSP100 (143) LAN or Epson TM-T88V LAN. You can also use the USB model of the Star TSP100 (143) if you prefer. For more information on how to install these devices for a Mac computer, click here.For LAN based printers we recommend Star TSP100 (143) or Epson TM-T88V. 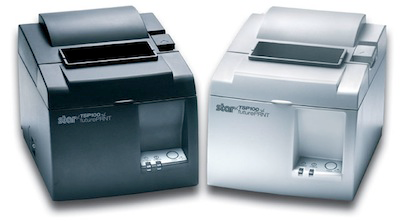 If you'd like to use a bluetooth printer for your iPad we recommend the Star 650II BTI, or the Star mPOP. Note: USB printers are not supported with iPad. For more information on how to use these devices on your iPad, click here. Peripherals are things like receipt printers, scanners and cash drawers; in other words, items that you use with your computer or iPad to enhance functionality. Epson TM-T82II (USB): For information on setting up these Mac supported printers with Vend, check out this page here. If you are planning to use a cash drawer, ensure your printer has an RJ12 port. Plugging an RJ12 cable from your cash drawer to your receipt printer will allow the cash drawer to open automatically after printing a receipt. For more information on this scroll down to the Cash Drawer section below. Printers for Windows and Mac will need the latest drivers to run. To download and install these drivers, select and follow the specific instructions for your supported printer here. Vend DOES NOT support serial/parallel adapted to USB printers. For more information on setting up these supported scanners with Vend, check out this page here. Vend supports two Cash Drawers, the Star SMD2-1214 and the Star SMD2-1317. In addition to these two you can also use the Star mPOP (Bluetooth) for iPad which is a receipt printer and cash drawer in one device. These can be connected to your receipt printer via an RJ12 cable and works with Windows, Mac or iPad. To learn more about these Cash Drawers and how to set them up with your receipt printer, click here. Vend has a built-in barcode generator to convert your SKUs into barcodes and print them to label sheets or a dedicated label printer. For barcode printing we recommend and support the Dymo 450 Turbo. The Dymo 450 Turbo is available for both Windows and Mac, and connects to your computer via USB. For a step by step guide on how to set up your Dymo for Mac or Windows, check out these help center articles here. While Dymo supports a range of different label sizes we recommend either the 11352, 30336 or 1738541 Dymo labels for use with Vend. Labels printed from Vend are in the Code 128 barcode format and are readable by most 2D scanners. Labels smaller than 21mm are not supported in Vend.